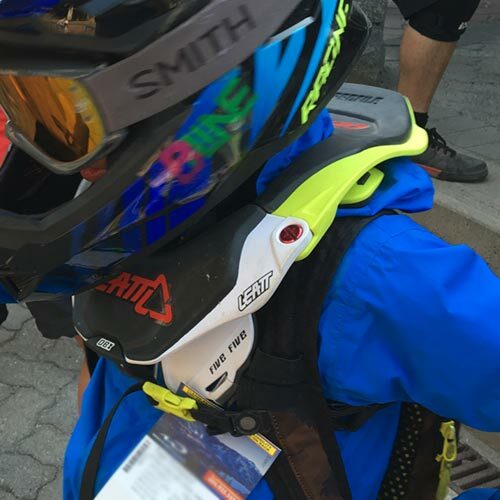 We initially purchased Leatt DBX 3 neck braces for our kids when they were racing BMX a few years ago. This is because we saw a lot of crashes in those days and wanted to provide as much protection as we could for our boys. The concept behind a neck brace is to redirect some of the force from the neck to the body and limit extreme range of motion of the neck in the event of a crash. Early in the summer of 2017, we noticed the DBX 3 brace was not fitting our oldest as well as it used to and decided he needed to move up to a larger size. We upgraded both kids to the DBX 5.5 (one junior and one adult S/M). The Leatt DBX 5.5 is a total re-deisgn when compared to the design DBX 3. We’ve had just one minor issue. The brace slightly rubs at contact points of the user’s chest and back. When used for several days in a row this can cause moderate discomfort. We were able to fix this with some well-placed band aids – some people even use tape. This issue should not be regarded as deal-breaker by any means with this product. 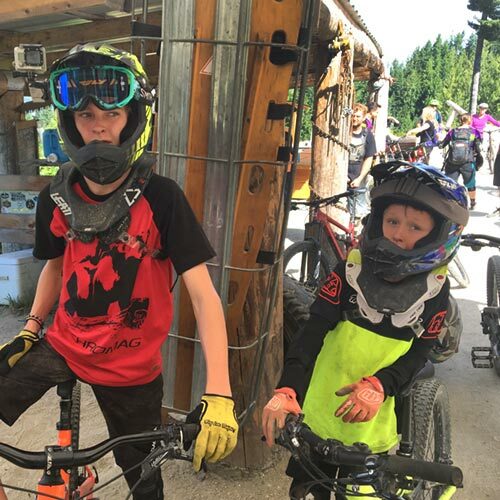 It’s a very acceptable trade-off for the additional protection the Leatt DBX 5.5 offers your young mountain bikers. 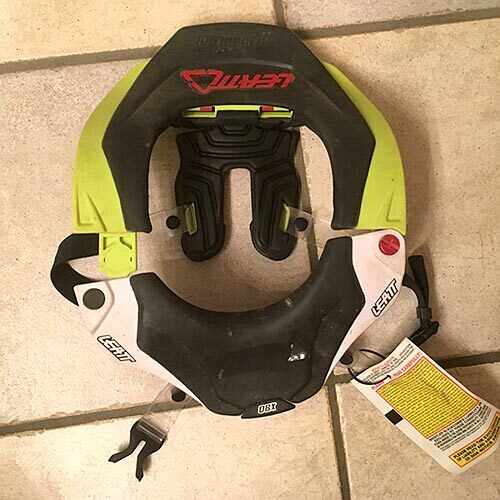 Setting up Leatt neck braces takes some time. Our local bike shop was happy to help us get the braces set-up to fit appropriately. This process took about 5-10 minutes. It’s important that the braces are adjusted and checked for fit while sitting on a bike. If you have to do it on your own, the braces come with well-illustrated instructions. 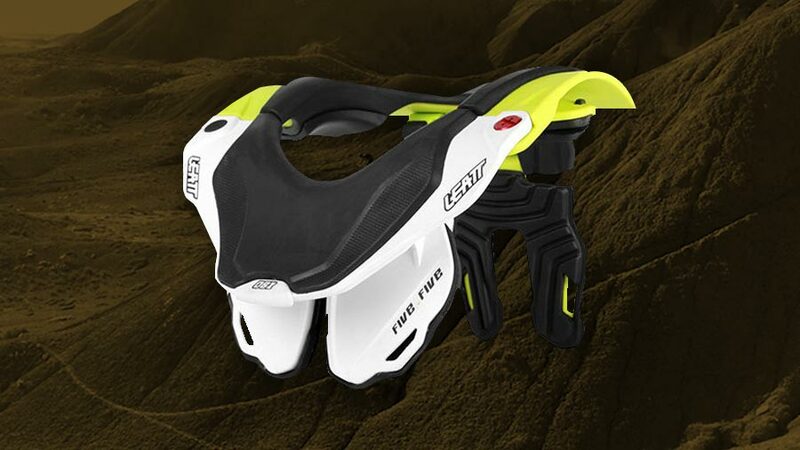 When it comes to the function and design of a neck brace for mountain biking, every company seems to have their own perspective on how it should be made. Leatt is one of the most popular brands and for good reason. The DBX 5.5 Junior is CE certified while still offering comfort and freedom of moment for the rider. The chassis of the brace has a small amount of flex to it in order to fit different body types. However, it remains rigid enough to still transfer harsh forces away for the spine and disperse it across the body. The CoreFlex rear strut has been designed to break away under sever impacts to ensure the best protection possible. Overall, the DMX 5.5 junior is a great buy for anyone who want their children to have more protection. Both of our kids have crashed while wearing their neck braces. Our oldest took a pretty good tumble off a step-down and went over the bars. Our youngest has taken several smaller falls when wearing his neck brace. His latest was when he plowed over a berm with speed at a bike park last summer. In our opinion, we believe the neck braces functioned and performed how they should have. The (neck) range of motion in our kids’ falls was limited by the neck braces. Will this always be the case? We have no idea. There are several factors that make each crash unique. 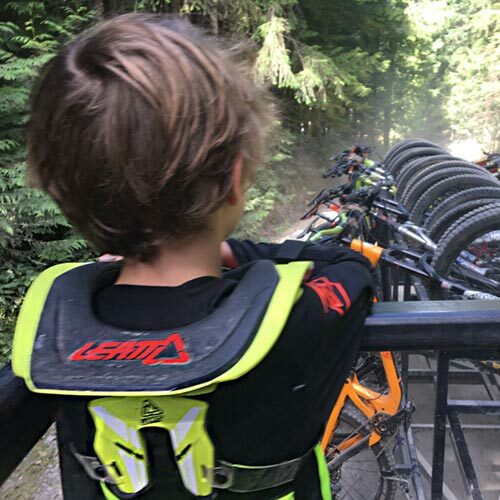 While we obviously hope neither of our kids experiences the type of crash that demonstrates the true value of the Leatt brace, we are happy to have the peace of mind that the extra protection provides. 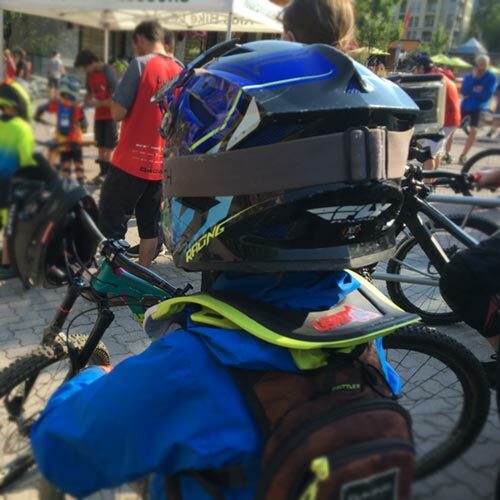 Lastly, our kids know that it’s their responsibility to wear their neck braces when conditions dictate the need. It’s just like wearing a seatbelt in the car. After a few days getting used to them, it’s just a regular habit. The neck braces go on just like knee pads and elbow pads when the situation is warranted.